components are water- and mold-resistant. The Total Basement Finishing (TBF) System transforms your basement into a beautiful, finished living area for you and your family to enjoy and love. TBF offers a total basement remodeling package. The basement wall systems, basement floor system, basement ceiling system, and basement window system are specifically designed for comfort and beauty in the basement. These finished basement systems resist mold, resist water, dampen noise, provide thermal insulation, are flexible enough to fit your basement finishing ideas, and look great when they're installed together! Finishing a basement is a great investment. Besides the obvious benefit of gaining more living space, a finished basement adds value to your home. The right finished basement system can save energy, increase comfort, and create a healthier home environment overall. Sign up today for a FREE Basement Finishing Estimate! TBF uses only the finest quality, high-end designer basement remodeling products. The basement ceiling tiles are designed to resist sagging, will never promote mold growth, and are the brightest, most attractive tiles on the market. Our ThermalDry® basement floor tile systems are available finished in a variety of carpeted and tiled designs, as well as being available in an unfinished style that you can lay carpet over to suit your personal style. Our Mill Creek Basement Flooring System combines the aesthetic beauty of natural wood with the durability, mold resistance and waterproof nature of vinyl. TBF's Everlast Basement Wall Panels come with a neutral beige finished surface that can be painted over and is strong enough to support the weight of a full-sized plasma TV. See our Finished Basement Pictures gallery for a look at how the Total Basement Finishing system can turn your basement into beautiful living space. The Total Basement Finishing basement wall system with SilverGlo™ insulation is rated R-13 for insulation quality â€” the highest rating for basement wall insulation. Our ThermalDry® Basement Floor Matting creates a thermal break between the finished basement area and the unfinished concrete basement floor, warming the floor, making it more comfortable, and enabling the basement space to be more effectively heated. These basement floor tiles also prevent moisture from seeping up into the carpet. Our ThermalDry® Insulated Floor Decking™ combines all the benefits of our popular floor matting, with a layer of SilverGlo™ foam insulation for added insulating value. This helps to prevent mold and the musty smell associated with carpet laid directly on a concrete floor. Our EverLast™ Basement Windows are made of crystal clear double thermopane glass, making your home more energy efficient while simultaneously adding light and beauty to your finished basement area! Total Basement Finishing was awarded the Quality and Innovation Award in 2007 by the Connecticut Quality Improvement Award Partnership for Total Basement Finishing's EverLast™ Finished Basement Wall Panels. The prize was based on their mold resistant, insulating, finishing versatility, and water-resistant qualities. Our SunHouse™ Basement Window Enclosure won the Quality and Innovation Award in 2005. Other great products that make up the TBF remodeling system include many varieties of basement lighting options, and the SaniDry™ basement dehumidifier and air filtration system. 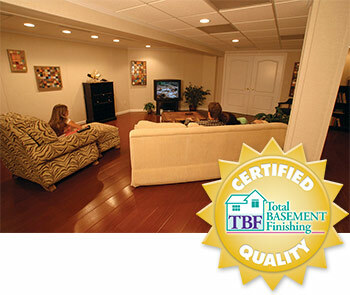 Total Basement Finishing is owned by Basement Systems Inc., the first name in responsible basement waterproofing. Basement Systems understands the importance of remodeling a basement with only products that can stand up to the damp environment of a subterranean space. In fact, we've been recommended by the Better Business Bureau! If you're going to finish your basement, finish it once and forever! 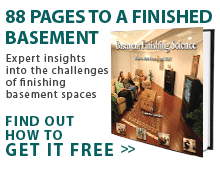 Sign up today for your FREE basement finishing estimate! Wet Drywall in Your Basement? We Have a Solution!